Stunned by his mother's recent death and appalled by the way his father sleepwalks through life, Jerry Renault, a New England high school student, ponders the poster in his locker-Do I dare disturb the universe? Part of his universe is Archie Costello, leader of a secret school societ-the Virgils-and master of intimidation. Archie himself is intimidated by a cool, ambitious teacher into having the Virgils spearhead the annual fund-raising event-a chocolate sale. 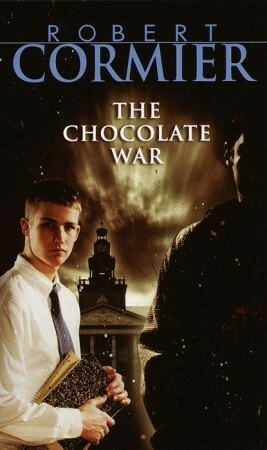 When Jerry refuses to be bullied into selling chocolates, he becomes a hero, but his defiance is a threat to Archie, the Virgils, and the school. In the inevitable showdown, Archie's skill at intimidation turns Jerry from hero to outcast, to victim, leaving him alone and terribly vulnerable. Suddenly, he was caught from behind and whirled violently, a toy boat caught in a whirlpool. A telephone rang in his ears. Hello, hello, I’m still here. As Jerry took another deep breath, a pain appeared, distant, small—a radar signal of distress. Bleep, I’m here. Pain. Jerry starts off as this cowardly kid, who’s trying out for the football team but it’s getting pummeled. As the story progresses we see him grow. He gets better at playing football, he makes a friend, and he has the courage to go through with assignment from The Vigil of denying the chocolates. Jerry constantly remembers the poster he has, the one that says “Do I dare disturb the universe?” One of his fears is to turning out like his father who leads a monotonous life of complacency. The poster and the desire to change his fate is what make him say no after the ten days are over. They tell you do your thing but they don’t mean it. They don’t want you to do your thing, not unless it happens to be their thing, too. It’s a laugh, Goober, a fake. Don't disturb the universe, Goober, not matter what the posters say. In YA novels these days there’s always the possibility of hope, of beating the system. The possibility of change for the better. You'll never find a character giving up, not even if their lives are at risks. In The Chocolate War there is an acceptance of the system when Jerry says/thinks this. After all the build up, and rooting for this character that’s had the courage to challenge the system…Jerry ends up being a coward. A longing filled him. Would a girl ever love him? The one devastating sorrow he carried within him was the fear that he would die before holding a girl’s breast in his hand. Jerry suddenly understood the poster—the solitary man on the beach standing upright and alone and unafraid, poised at the moment of making himself heard and known in the world, the universe. Was Leon right, after all? That the school was more important than any one kid? But weren’t individuals important, too? “You see Carter, people are two things: greedy and cruel. So we have a perfect setup here. The greed part—a kid pays a buck for a chance to win a hundred. Plus fifty boxes of chocolates. The cruel part—watching two guys hitting each other, maybe hurting each other, while they’re safe in the bleachers. That’s why it works, Carter, because we’re all bastards.